Six filling spouts that extend the filling time, permanent compression of the product through specially designed vibrating plates and a continuous rotating carousel are the result of an unique system. All movements are controlled by one intelligent master servo drive-controller. The CIRCUPAC is designed for prefabricated open-mouth bags with a filling weight of 10 to 50 kg. The whole bagging system is divided into individual working steps. Each step is controlled accurately before the next one is implemented – the result is an innovative process of highest reliability and with maximum performance. 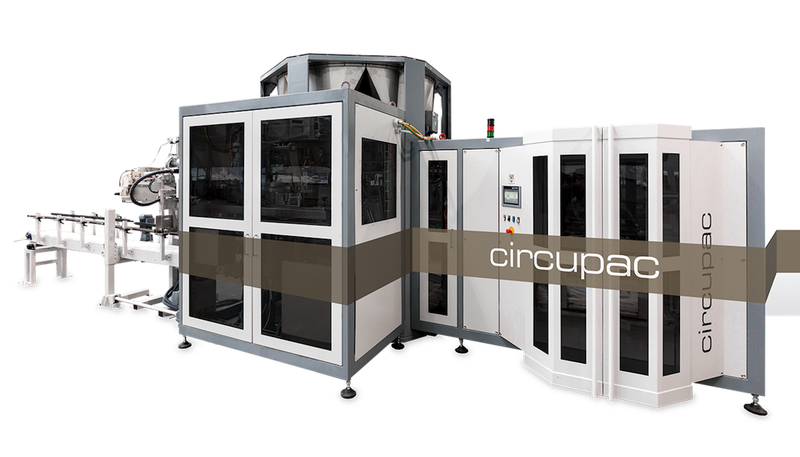 The STATEC BINDER CIRCUPAC fills the bags while the carousel is turning. Double Screw Dosing System: The product is dosed by a high-performance double screw dosing system. The screws are motor driven with a frequency converter. For highest precision a large screw does the coarse feed and a small one does the fine feed into the weigh hopper. After weighing the weigh hopper opens and the product flows through a discharge chute into the bag which is placed on the filling spout. Specially designed Bag Magazine: Vacuum suction cups pick up the bags one by one from the magazine and transport them to the delivery table. A specially designed singling out-grid simplifies the handling with soft bags. Once the bag magazine is empty, it turns and a second magazine goes into operation. Meanwhile the empty one can be refilled during operation. Accurate Bag Transport and Positioning: The bag is moved from the delivery table to the filling clamp. During this process a film thickness measurement recognizes if two or more bags stick together and rejects them if required. Then the bag is opened by vacuum suckers and fixed on the filling spout. A pneumatic control system checks if the bag is placed correctly. Dust-tight Filling Spouts and continuous rotating Carousel: The bag is filled with the product while it is moving to the next station. Six dust-tight filling spouts can be installed in the carousel which is continuously turning. All movements are driven by one intelligent master servo drive-controller. If the capacity should be adjusted only one parameter has to be changed. This innovative system promises easy operation and maintenance. In order to get a compact filled bag specially designed vibrating plates compress the product constantly. Dust extraction is ensured through an internal piping system. Bag Removal and Closing: At the end of the bagging process the filled bag is gripped by two gripper arms and positioned on the transport conveyor behind. From there the bag is transported into the bag closing unit. A fully automatic labelling unit can be supplemented. The CIRCUPAC features a sturdy and compact design and a fully enclosed housing. Safety switches that are fixed on the doors guarantee that the machine stops when one of it is opened. The machine is CE-certified, has an ATEX-execution and all contact parts are in stainless steel. Whether it is wheat flour, rye flour, corn flour, pet or animal food, milk powder or baking mixtures: all kind of powdery products can be filled with the CIRCUPAC.